2017 Water Conservation - Floral City Water Association is a leader in water conservation. 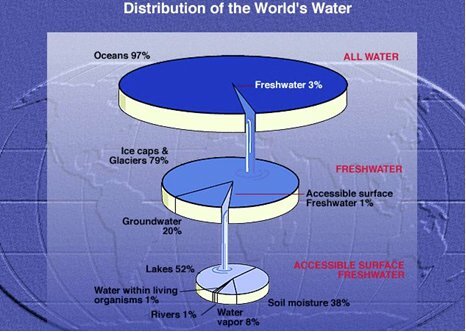 As the below image illustrates, very little water on this planet is available for human consumption. Understanding this is critical as is the need for conservation. The information and links below will educate and explain ways you can conserve water and provide links to other sites that will explain in more detail just how valuable and rare this resource is. 97.24% of water is salt water. 2.15% of water is frozen in the icecaps and glaciers. The rest is in lakes, rivers, air and the soil. Less than 1 percent can be used for drinking purposes. Almost ½ of the world’s population does not have access to clean water. U.S. Drought Monitor – Drought information for the entire country. Southwest Florida Water Management District’s Conservation Page – Direct link to the Conservation section. Citrus County Water Conservation Page – Nice page by Citrus County provides tips on conserving water inside and outside the hose and tips on fixing leaks. Teaching Kids about Conservation – Site with links to educate about conservation. 100+ Ways to Conserve Water – Excellent Resources and Links. Kids section with games. Water Science For Schools – Site by the US Geological Survey. Very informative for all ages. Environmental Protection Agency Water Site – EPA’s Water Section with a variety of links and information. Southwest Florida Water Management District – Informational site covering a large amount of material. Very good “Kids Section”. Drink Tap – America Water Works Association Educational Site. Florida’s Water Resources – Large pdf file from the USGS with information about Florida groundwater and aquifers. Water Use in Florida – Very detailed USGS site with information specific to Florida. Florida DEP – The Department of Environmental Protection. American Backflow Prevention Association (ABPA) – Provides information about Backflow and Cross-Connections. Florida Outdoor Burning Laws – From the Division of Forestry. If you find a link that would be useful to our membership, please feel free to e-mail the link to and we may add it to this page. If you find any dead links, please notify us as well.